The episode opens on grim flashbacks of Jesse being submerged in a pond while locked in a coffin. He's just a teenager and his grandmother L'Angelle is ordering this shocking treatment in order to break his will. In the present day plot, there are divers that have worked to draw the armored truck from the swamp under the orders of Jesse and Tulip. Tulip is furious that Jesse didn't kill him and also lied about it. There's still tensions between the two from all the baggage in their relationships. Jesse assures Tulip that the Saint can't get out but when he opens the truck, he finds that the Saint has disappeared. This only further escalates the animosity between the two. Lara Featherstone reports back to Herr Starr about what has just transpired between Jesse and Tulip. Herr Starr reveals to his agents about his plan to replace the mentally handicapped Messiah with Jesse. He believes this will bring real order and control to the world. 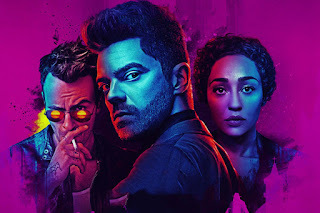 Jesse gets into an argument with Tulip and Cassidy but the conversation is interrupted when he begins to intuitively realise that the man in the dog costume that he briefly encountered at the beginning of his search for God in New Orleans is possibly God himself. Tulip and Cassidy won't go with him, so Jesse must follow this lead on his own. Eugene decides to try to team up with Hitler and Tyler to try to escape Hell. Eugene and Tyler go with Hitler to relive his worst memory, which is of his last day as a good person. He had tried to pitch his art to an art dealer but his work was insulted. He then had an opportunity to stand up for himself when some men came in and attacked the restaurant he was in but he maintained his demure approach. Things escalate further when the woman he is with leaves him for his lack of drive and aggression, and the last piece of plum cake he had ordered went to a Jewish man that arrived after Hitler had already ordered. Tulip wants to have all of the Saint's weapons melted down but they are indestructible by any regular mortal methods so she opts to send mail them to Brazil instead. Out of sight, out of mind. Jesse is unable to find the man in the dog suit and visit Herr Starr to demand answers. Starr didn't know about God, and Jesse now blames himself for not having realised right then that it was God. When Starr plays a recording of Jesse's prayers as a teenager, he is heard to be begging for his father's death and being sent to Hell. Once again Starr offers Jesse the opportunity to take over the vacancy God has left but Jesse declines it again, even going so far as to command Starr to shove the tapes of his prayers up his bum. This leads to the reveal that the Grail had been behind swapping out the truck in the swamp and the Saint of Killers is released under Starr's order. Back in Hell, Eugene reaffirms his commitment to escaping, teaming up with Hitler in the process, and the pair enter the "Hole" in pursuit of a backdoor out. The Defenders have made their getaway and take refuge in a nearby Chinese restaurant. They're still getting adjusted to getting introduced to one another. Matt initially wants to keep Jessica's scarf tied around his head to maintain some anonymity, while Danny uses his black card to pay off the restaurant owner's rent for the next six months and order some food in order to keep them appeased. Danny wants them all to team up but Matt is already reluctant about returning to vigilantism, let alone teaming up with others. Jessica gives him her own unique brand of a pep-talk, and Matt finally relents by removing his mask and introducing himself to the others. Elektra is shown to be confused about her existential purpose, and Alexandra is more than happy to fill her head with all kinds of rhetoric about being the Black Sky and being a weapon. The other members of the Hand are skeptical of Elektra and whether she is truly loyal to them, or whether her connection to Matt will pose a problem. Alexandra's health continues to decline. 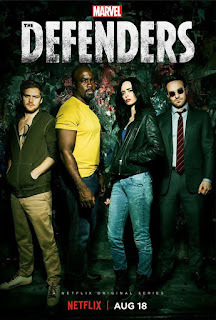 The Defenders are discussing whether or not they will team up together, with Matt being particularly reluctant to join the team. Their meeting is interrupted by the arrival of Stick, who is fresh off his escape from the Hand. Stick informs them that the elders of K'un-Lun had come together a long time ago in order to study the healing powers of qi and five of them had hoped to use that power to gain immortality. These elders were cast out for this, and thus became the five fingers of the Hand. Alexandra is the main leader of the Hand, and the other members include Madame Gao, Sowande (the one that has been recruiting young people in Harlem, Murakami, and Bakuto who was recently killed. All the information proves too overwhelming for Jessica, who excuses herself from the meeting to continue her investigation alone, despite Luke's personal plea for her to stay with them. Jessica goes to check on the widow of John Raymond and is alarmed to learn that a man had come to her house to claim he was there to be protective police service but didn't ever identify himself with a badge. Jessica fights him, realizing he's an agent of the Hand. The rest of the Defenders remain at the restaurant and Stick and Matt discuss Elektra's resurrection in private. Matt is certain he can reach her, due to her hesitation to kill him at Midland Circle but Stick is insistent that at some point, Elektra will have to die again and is no longer the woman he trained and Matt loved. The conversation is short-lived as Alexandra arrives at the restaurant. She offers to spare New York from destruction if Danny will leave with her, as the Iron Fist is a necessary part of the larger plan the Hand has. Danny refuses to do so, and then Elektra arrives prepared to fight the group. But before the fight can begin, Jessica crashes into the restaurant with a car. Jessica is now prepared to fight Elektra with the other Defenders (plus Stick). Some months ago, Alexandra is informed that agents of the Hand have acquired the Black Sky. This is an ancient weapon prophesised to be something that will help them in their quest for power. The Black Sky is Elektra's deceased body. The Hand is running low on resources and must use the last of what they have to gather what's necessary to perform a ritual that will resurrect her. When Elektra rises, she appears to have no memory of who she once was and must regain her faculties. She still has strength and fighting skills but being resurrected means relearning and adjusting to being alive. Alexandra is with Elektra every step of the way to teach her to be the weapon that the Hand can use against those that would try to stop them. Elektra helps Alexandra to interrogate Stick, who is amazed to learn of her resurrection. However, Stick gets his own hand cut off so he can make his escape. Matt makes his best attempts to help Jessica as her legal representation but she is dismissive of his taking her case. However, he picks up on hints that there is more to her case than he first realised and begins to investigate it himself by following her. Jessica goes to visit the once-missing-but-now-dead man John's wife, having now agreed to fully take on the case of investigating what he was getting into. Afterwards, she realises that Matt is following her so she slips him and begins to follow him instead. She follows his down an alleyway where she sees him do some parkour and even photographs him. Luke expresses his guilt to Claire about not being able to save Cole, who has now been arrested. He also shares about the confrontation with a skinny white kid with a glowing hand, leading Claire to realise it's Danny that had fought him. She calls Danny and Colleen and sets up a meeting for Luke and Danny to be introduced. Things remain tense between the two, as Luke can't relate to Danny's tone-deaf privilege and his inability to utilise the resources at his disposal to more effectively fight the causes he claims to be in favour of. Luke storms out and goes to visit Cole in jail. Afterwards he visits Cole's mother to check in on her but things take a dark turn when she gets a call that Cole died in jail, presumably by the Hand. Danny takes inspiration from what Luke said about his privilege so he uses his corporate connections to find the location of the Hand's new business front, a company called Midland Circle. Jessica arrives there from having followed her own leads and Matt follows her there too. Luke also arrives to help Danny, who has crashed a large meeting of the higher-ups of the Hand. A fight breaks out between the Defenders and the Hand and after some time, Elektra emerges and begins fighting Matt though it takes him some time to realise who it is that he's fighting. The Defenders all escape together after Danny punches Elektra through a wall with his magical glowing hand. After just a few days, Iron Sky: The Roleplaying Game was already funded. Today, the Iron Sky team announced more extras as it gets ready to try to reach for those much-coveted stretch goals. The Iron Sky RPG team has announced Backerkit support as well as several add-ons and pledge options, including the inclusion of the original Iron Sky comic. The Iron Sky team has also announced it will launch a Living Campaign at Gen Con 2018 — a shared Iron Sky: The RPG universe players can be part of. Their Characters’ actions will have an impact on future Adventures and Character advancement, making sure the players get immersed into the Iron Sky setting even more than usual. Details will be made available upon the RPG launch in February 2018. The RPG will allow players to take on the role of either characters from the original film, pregenerated characters provided in the rulebook, or completely new characters generated with the Synthesis rules system. All of the major movie characters will be included as (N)PC’s, while the rules will cover everything from social interaction to hand to hand and space combat. 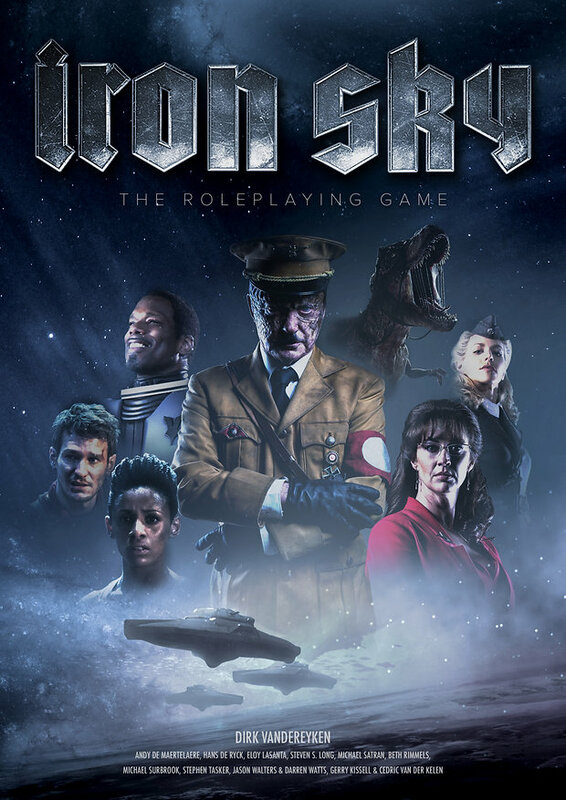 Iron Sky: The Roleplaying Game uses Genre Tropes, specific, but easy rules that allows Gamemasters and players to tweak their campaigns to any genre. ‘It’s a lot more specific than just saying “in gritty campaigns, multiply damage by factor X”. We’ve listed many different genres and each of them comes with just a few rules that’ll allow you to capture the right atmosphere. Both Iron Sky and the upcoming Iron Sky the Coming Race use strong visuals. ‘We wanted to reflect that in the RPG as well,’ says Dirk, ‘which is why we’re including hundreds of pictures, several pages out of the comic — the signed limited edition book even includes the entire comic — and cool designs,’ says Dirk. ‘We’ve also created great-looking accessories. Again, you don’t need them to play the game, but they don’t only make it easier and more fun to play, they add a touch of visual flair to your gaming table’. 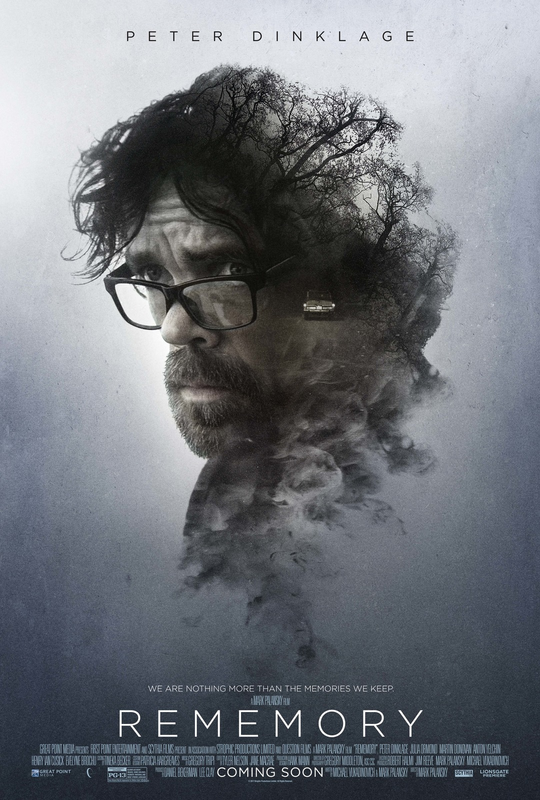 Today, Google Play released the sci-fi mystery film REMEMORY, starring Peter Dinklage and Julia Ormond, alongside the late Anton Yelchin, exclusively for FREE as a digital exclusive. Directed by Mark Palansky, the film explores the ways in which our past defines the present. In Rememory, a visionary scientific pioneer (Martin Donovan) is found dead shortly after unveiling his newest invention: a device able to extract, record and play a person’s memories. His grieving wife (Julia Ormond) retreats into her house and cuts off contact with the outside world when a mysterious man (Peter Dinklage) shows up. After stealing the machine, he uses it to try and solve the mystery, beginning an investigation of memories that lead him to unexpected and dangerous places. LOS ANGELES, CA (August 14, 2017) – REMEMORY, the sci-fi mystery directed by Mark Palansky (PENELOPE, A SERIES OF UNFORTUNATE EVENTS) and starring Emmy Award® winners Peter Dinklage (GAME OF THRONES, X-MEN: DAYS OF FUTURE PAST) and Julia Ormond (MAD MEN, LEGENDS OF THE FALL), alongside the late Anton Yelchin (STAR TREK, LIKE CRAZY), will debut exclusively for free for a limited time on Google Play* on August 24, 2017. The film will also be released by Lionsgate Premiere in select theaters on September 8, 2017. REMEMORY was written by Michael Vukadinovich and Mark Palansky and produced by Lee Clay and Daniel Bekerman. Robert Halmi and Jim Reeve serve as executive producers. The film explores the ways in which our past defines the present. A visionary scientific pioneer (Martin Donovan) is found dead shortly after unveiling his newest invention: a device able to extract, record and play a person’s memories. His grieving wife (Julia Ormond) retreats into her house and cuts off contact with the outside world when a mysterious man (Peter Dinklage) shows up. After stealing the machine, he uses it to try and solve the mystery, beginning an investigation of memories that lead him to unexpected and dangerous places. REMEMORY had its world premiere at the 2017 Sundance Film Festival and marks the first time that Google Play will exclusively debut an Official Selection from the festival. The film was financed by Great Point Media who hold the international rights to the film. *REMEMORY will be available for free from August 24 to September 20, 2017 on Google Play to residents in the United States, Canada, United Kingdom, Ireland, Australia, New Zealand, Albania, Antigua and Barbuda, Belize, Botswana, Cambodia, Fiji, Iceland, Jamaica, Macedonia, Malta, Namibia, Nepal, Papua New Guinea, Philippines, Rwanda, Sri Lanka, Trinidad and Tobago, Uganda, Zambia and Zimbabwe. Founded in 2012 by Robert Halmi and Jim Reeve, Great Point Media specializes in development, investment and exploitation of intellectual property in entertainment media. Halmi is an Emmy Award and Golden Globe Award-winning film and television producer with over 300 production credits, including Tin Man, Farscape, and Lonesome Dove. Reeve is an Emmy Award-winning producer with 25 years’ experience in production finance and distribution with credits including Foyle’s War and Jack Higgins’ On Dangerous Ground. Recent projects backed by Great Point Media include Lady Macbeth, Christine, Rememory, Complete Unknown and The Party. In Cambodia, a resurrected Elektra is fighting alongside agents of the Hand. Her face isn't officially revealed but all clues point to it being Elektra that lands some deliciously wicked blows against Danny Rand in battle. She gets away, of course, and Danny and Colleen Wing must pick up the pieces of their investigation into the Hand. Their lead was killed in battle but before he dies, informs them that the fight they are involved in is going on in New York City. Each of the other Defenders is at a new turning point in life. Matt Murdock is no longer doing his Daredevil vigilantism and is focusing only on his work as a pro bono lawyer. The trauma of losing Elektra in battle has weighed heavily on his conscience. He doesn't work with Foggy or Karen anymore, either. Jessica Jones is now known to the city for her heroism in defeating Kilgrave and despite Trish's pushing, Jessica is still reluctant to take on any sort of superhero role. Luke Cage has had his name cleared by Foggy, who is now working for Jeri Hogarth's firm. Just as soon as he is released from prison, he goes to see Claire Temple, with whom he had been corresponding during his imprisonment. The two consummate their relationship. Viewers are also introduced to the enigmatic Alexandra, leader of the Hand, who appears to be suffering from some health issues. Jessica meets Michelle Raymond and her daughter Lexi when the two are waiting for her at her office/apartment. Michelle's husband John is missing. He works as an architect and though Jessica is dismissive of the woman's pleas, she eventually decides to take the case after they leave when she receives a call from a mysterious, anonymous caller that warns her not to look for John. Jessica later discovers a massive stash of explosives that John had stockpiled for some unknown purpose. Misty visits Luke and informs him that some local Harlem young-adults have been getting into trouble with a mysterious business and eventually end up dead. These youths are all seemingly at a crossroads and get swept up in the wrong direction and Misty urges Luke to use his influence over the nieghbourhood to try to save more from falling into this same trap. Alexandra is informed that all of her major organs are failing. She is dying with little time left so she commands her colleagues in the Hand to speed up their plans. Shortly afterward, a massive earthquake surges through New York City that all of the Defenders feel, including Danny who has arrived back in New York with Colleen. Alexandra watches from the rooftop of a building with the resurrected Elektra. Marvel's The Defenders is available for streaming on Netflix. See how the first fight sequence between Tom Cruise and Sofia Boutella was made in this awesome behind-the-scenes look in celebration of THE MUMMY now available on Digital. When an ancient evil rises up to seek revenge on our world, relive the epic saga in The Mummy, unleashing onto Digital on August 22, 2017, and on 4K Ultra HD, Blu-ray™, DVD and On Demand on September 12, 2017 from Universal Pictures Home Entertainment. 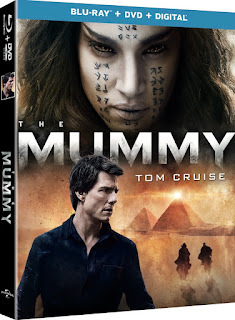 Packed with over an hour of special bonus content, experience never-before-scene footage and hidden secrets The Mummy has within with stars Tom Cruise, Sofia Boutella, Annabelle Wallis, Russell Crowe, and Jake Johnson.